Nigerian President Muhammadu Buhari (center) meets scores of freed Dapchi schoolgirls released by Boko Haram on Wednesday. Still in captivity is 15-year-old Leah Sharibu, the only Christian girl abducted who refused to convert to Islam. Rebecca Sharibu, mother of 15-year-old Leah, abducted by Boko Haram with 109 schoolmates last month. Leah remains a captive after refusing to renounce Christianity and become a Muslim. 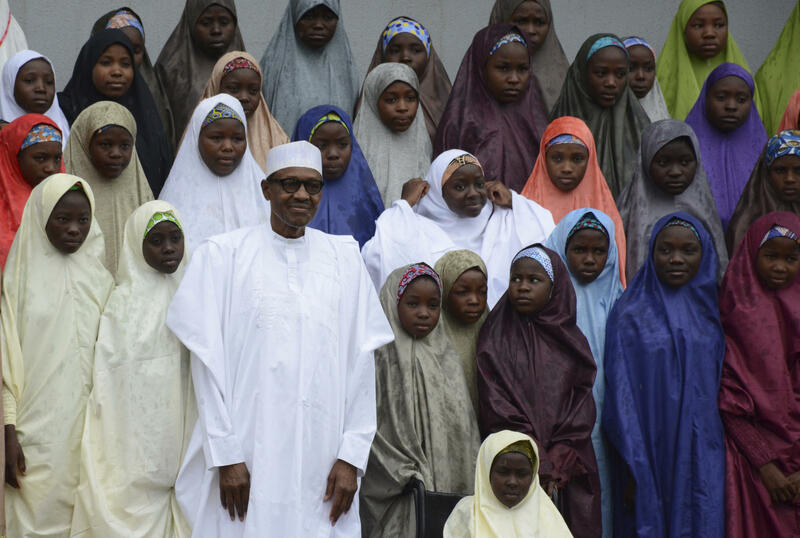 Nigeria's president, Muhammadu Buhari, has been meeting more than 100 girls after their dramatic release this week by Boko Haram, a month after they were abducted from their boarding school dormitories in the town of Dapchi in the northeast. Buhari held the meeting at the presidential villa in the capital, Abuja, Friday with scores of Dapchi schoolgirls and one lone boy freed with them on Wednesday. He told the girls seized in the Feb. 19 mass abduction by an ISIS-affiliated faction of Boko Haram to embrace the future and pursue their dreams, without fear. "To the rescued students, we want to assure you as our daughters that you will freely live and pursue your dreams in Nigeria, without fear of violence or molestation." Buhari's administration, which was criticized for a confused initial response to the attack on the school last month, said in a statement the Dapchi girls were returned "through back-channel efforts and with the help of some friends of the country and that it was unconditional." A statement said the government did not pay a ransom nor swap captive insurgents for the release of the schoolgirls. Earlier Buhari's government said it would pursue negotiations with — rather than a military offensive against — Boko Haram to try to secure the girls' freedom. This shift in policy comes a year before key elections in Nigeria and public opinion is crucial, though Buhari has not indicated whether he will seek a second term. Comparisons have been made between two multiple abductions by Boko Haram at girls' boarding schools in the past four years — the first in Chibok in April 2014 under a previous government, when 276 girls were kidnapped from their dorms and, under Buhari's watch, in Dapchi last month, for which the president has drawn a stern rebuke from the public. More than a hundred Chibok schoolgirls remain unaccounted for almost four years after their abduction. In both instances heavily-armed gunmen have stormed residential school premises and were able to capture many students, with no resistance from Nigeria's security forces. Amnesty International said this week that the military and police had failed to act on warnings about the Boko Haram attack on Dapchi hours before the mass abduction of the schoolgirls. On a visit to Dapchi last week, Buhari had promised the girls would be returned. Five of the schoolgirls reportedly died in captivity over the past month. Four have broken limbs and are in wheelchairs. Speaking for her schoolmates, one freed girl, Fatima, expressed gratitude to President Buhari for his intervention, saying, "On behalf of all of us, we want to thank you for saving our lives and bringing us home." But one of the abducted Dapchi students, 15-year-old, Leah Sharibu, remains in Boko Haram captivity. The president has promised her parents he will not abandon the missing teen and will bring her home to her family. So why was she was left behind? Leah Sharibu was the only Christian among the 110 girls kidnapped from Dapchi that Monday night in February. Her freed schoolmates have been telling her parents she refused to convert to Islam, at the insistence of Boko Haram. So the extremist group refused to release her. Leah's father, Nathan Sharibu, told NPR by phone from Dapchi that he's proud of his daughter for resisting the demands of Boko Haram fighters. "I asked what is the reason that they did not release Leah? I heard they said Leah must become a Muslim. Those who captured her, captured them, told Leah that if she wants to be released she must be a Muslim and Leah said she will never be a Muslim, she was a Christian. And that's why they did not release her," the father said. 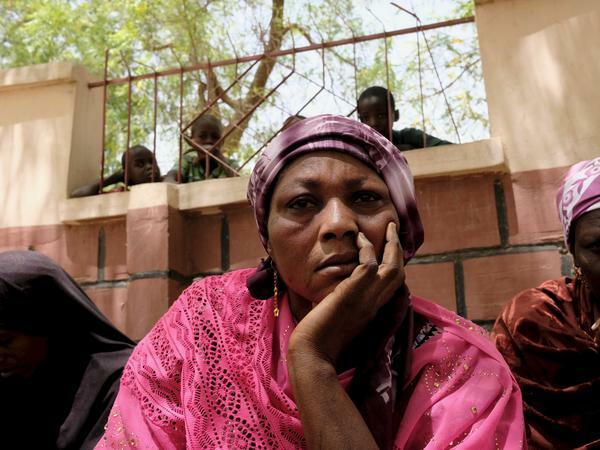 "I'm very, very happy about my daughter the way she behaved and did not accept to be a Muslim as the only Christian girl" among the 110 girls in Boko Haram captivity, Sharibu said. Dapchi is a small, predominantly Muslim town in Nigeria's northeast Yobe state, in a region hard hit by Boko Haram violence. The Sharibu family is part of the town's Christian minority. Nathan Sharibu says families from both religions have always lived peacefully side by side for decades and that everyone in the village is praying for the safe return of his daughter. But Leah's father admits it was devastating, especially for his wife Rebecca, who fell down when they realized their daughter Leah was not among the girls being released by Boko Haram. "I feel very, very sad. My wife, when she heard the abducted girls were on the way, she was running towards them, but when she discovered that her daughter Leah was not among them she fainted and was rushed to General Hospital, Dapchi." Rebecca Sharibu told NPR by phone, "I feel so bad and so worried. I am so worried about her. I'm still fasting, every day I'm fasting for Leah. Let the government try their best to bring her for me." Leah's mother echoed her husband, saying the entire Dapchi community – Muslims and Christians alike – is praying her daughter Leah will soon be reunited with their family. When NPR met Sharibu in Dapchi earlier this month, she proudly described her daughter as a good student who liked to learn and liked school. However she urged the Buhari administration to improve and tighten security at all schools in northeast Nigeria which have suffered extremist violence during Boko Haram's nearly 10-year insurgency. By phone, Rebecca Sharibu described how the teen's schoolmates said they'd cried with her daughter in captivity and begged Leah to convert when they understood she would not be leaving for home with them. But Leah, a staunch Christian, had refused to renounce her religion and was left behind. Boko Haram said the group returned most of the missing schoolgirls to Dapchi before dawn on Wednesday — a month after their mass abduction — "out of pity." The release of the girls came with a chilling warning from their captors – "no more school." "We did it out of pity. And don't ever put your daughters in school again," the extremists reportedly told Dapchi residents. Boko Haram loosely translates as Western education is forbidden or sinful. The released schoolgirls confirm Boko Haram fighters warned them they would be kidnapped again if they went back to school. But Leah Sharibu's father says he would want her to continue her education once she's back home. "Even today if my daughter comes, I can send her to school tomorrow. I must send my children to school," Sharibu said. "If Leah comes (back), she will go back to school. Due to the prayers of the nation, I feel Leah will be released." President Buhari has promised the Sharibus his administration will not "abandon" Leah and "will do its utmost to return the lone, missing Dapchi schoolgirl safely back home to her parents." In a statement Thursday, Buhari's office said, "The administration will not relent in efforts to bring Leah Sharibu safely back home to her parents as it has done for the other girls after she was held back by the terrorists over her decision, as reported, not to convert from Christianity to Islam." Buhari, who's also a Muslim, further said in his statement: "President Buhari is fully conscious of his duty under the constitution to protect all Nigerians, irrespective of faith, ethnic background or geopolitical location and will not shirk in this responsibility. The President is equally mindful of the fact that true followers of Islam all over the world respect the injunction that there is no compulsion in religion." To Nigeria now, where more than 100 girls were released by Boko Haram last week, a month after they were abducted from their boarding school in the northeast town of Dapchi. But one 15-year-old remains in captivity. NPR's Ofeibea Quist-Arcton reports on why she was left behind. OFEIBEA QUIST-ARCTON, BYLINE: President Muhammadu Buhari has met 106 Dapchi schoolgirls and one lone boy freed with them. He told the girls, seized in the February 19 mass abduction by an ISIS-affiliated faction of Boko Haram, to embrace the future and pursue their dreams without fear. PRESIDENT MUHAMMADU BUHARI: We want to ensure you as our daughters that you will freely live and pursue your dreams in Nigeria, without fear of violence. QUIST-ARCTON: But one Dapchi schoolgirl, 15-year-old Leah Sharibu is Christian and refused to convert to Islam. So the extremists are still holding her captive. That's what her freed schoolmates have been telling Leah Sharibu's parents. Her father, Nathan Sharibu, says he's proud of his daughter for resisting the demands of Boko Haram fighters. NATHAN SHARIBU: Those who captured Leah told Leah that if she wants to be released, Leah must become a Muslim. And Leah said that she will never be a Muslim. She was a Christian. I'm very, very happy about my daughter - the way she behaved. QUIST-ARCTON: But Nathan Sharibu admits it was devastating especially for his wife, who fell down, fainted and had to be taken to the hospital when she realized her daughter was not among the girls being released by Boko Haram. Rebecca Sharibu says she feels so bad for Leah. REBECCA SHARIBU: I'm so worried. I am still worried about her. Every day I'm doing fasting for Leah. I'm still fasting. Let the government try their best to bring her to me. QUIST-ARCTON: The mother says the entire Dapchi community - Muslims and Christians alike - are praying her daughter Leah will soon be reunited with their family. President Buhari has promised the Sharibus that his administration will do its utmost to return the lone missing Dapchi girl safely back home to her parents. Ofeibea Quist-Arcton, NPR News. Transcript provided by NPR, Copyright NPR.